I am getting excited/anxious for Alt Summit - I had lunch with Lillian the other day and it turns out we both booked the same flight, so I'll have a flying buddy to SLC! 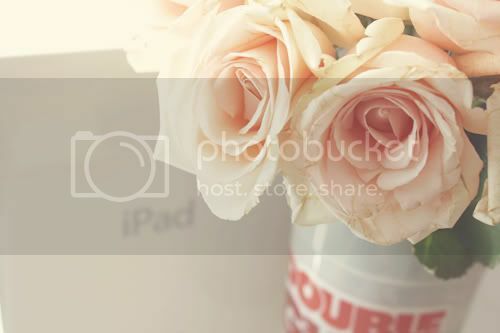 Nick gave me roses when I got home from San Francisco last weekend, presented in a double gulp cup, he's so cute. We also finally opened our presents the other day. Yea, our Christmas presents. I like to prolong things so it lasts longer ;) Anyway, he surprised me with an iPad. He was like "You can take it to alt with you and take notes and stuff" Goodness, how sweet is he? Well I haven't left links in a while so I thought I'd leave you with some weekend links. + Hide & Seek Workshop - a workshop by Found Vintage Rentals. I got all my furniture from Jeni at Found, she is amazing and so is her stuff. When I first stopped by her studio, I left saying to Nick, "How awesome is her job? I want to do that!" heh. But anyway, if you're in Orange County / Los Angeles - She is holding a workshop about starting your own vintage rental business, I bet there's a lot to know! + Handmade Valentine Swap - I met Lyndsey at Dionne's blogger meet-up and she is hosting a Valentine swap if you want to participate for v-day next month! Fun stuff, I love swaps. + 5 reasons why bloggers quit blogging - This is such an interesting site with a lot of great articles. I thought this one was interesting, because I so often come across blogs that aren't posting anymore. So maybe this will help you to not become discouraged. I also thought this article was interesting too..
+ Hey Soul Sister Glee Performance - I cannot get enough of Darren Criss, I love his voice! Also - if you're a glee fan, did you see this CUTE video of the glee mini me's? adorable. + jcrew extra 40% off sale items - jcrew is doing an extra 40% off sale items + free shipping on $100 or more. so tempting! use code "MUSTHAVE". Can I justify spending $100? Well that's all I have for you, sort of random stuff ;) Hope you all have a wonderful weekend, see you on Monday! xo. wow, thanks so much for posting about the swap! hooray. have a great weekend! PS. Those are lovely flowers! What booth will you be in at the Flea Market?? I haven't been since October, and can't wait to go!!! Have a lovely weekend - thank you for all the inspiration this week! thanks for those links! I'm excited about the valentine swap :) have a wonderful weekend! The sleeping baby video is ADORABLE. Your husband is so incredibly sweet! Happy day! P.S. Have you seen the post I did about your pocket watch? Have a wonderful weekend and hope to see/meet you at Alt next week! mini glees are oh so cute. seriously that video made my day. First of all, what a lovely picture (and a great boyfriend you have)! And thanks for the link to Blog Godown - it's a great site that I hadn't seen before. Hi! I love your blog, especially your business card posts! Now I want to make some of my own, haha. Have a great weekend! What a nice photo you have! Your husband is so sweet! Cherish the moment! Jon surprised me with a MacBook this weekend; the in-laws gave me an iPad for Christmas and our old G5 was too old to sync it with. He said: I know you like to blog, and do Etsy, and are learning a bit of graphic design...I hope this makes it easier. He was home on Friday and researched all day long. That was the most expensive day off ever!! !